Some of you may know that Richard Dawkins was scheduled to participate. 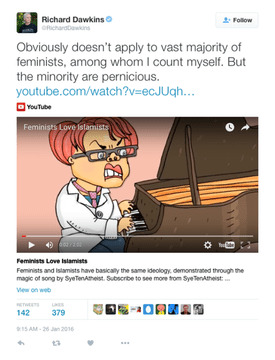 However, he retweeted a really tasteless video with a very despicable comment. This may be the first time our secular community has taken such a bold action in support of feminism and against hate speech. The canceling of Richard Dawkins rates to cost them a great deal of money that they desperately need to hold these conferences in the first place. And I can tell you that NECSS is a wonderful weekend filled with fantastic panels and speakers. This year you can hear from Richard Wiseman, Bill Nye, and my favorite, Carol Tavris! Plus many many more wonderful speakers. I urge all of you to support this action by attending this conference. Early Bird Registration is now available. Not only will you have a great time, you will be making a statement of support for a very very important organization. NECSS is produced by two 501(c)3 educational not-for-profit organizations: New York City Skeptics and the New England Skeptical Society. The Skeptics’ Guide to the Universe and The Society for Science-Based Medicine are also major sponsors. The New York City Skeptics is a member (as are we) of the Reasonable New York Coalition. Let’s show them we appreciate what they have done!